"Deposit Bag 15'' X 20'' TripLok, clear w/pocket" product is already in your cart. 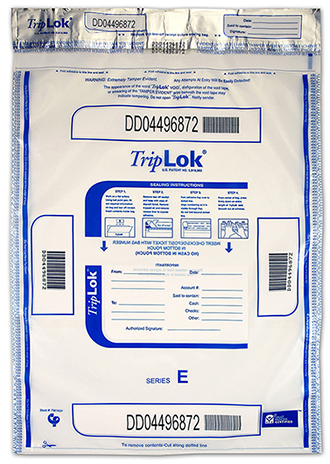 This 15" x 20" TripLok deposit bag available in high performance white film, has an external pocket most commonly used for checks and deposit tickets. These bags are secure and easy to use for cash transfers and store deposits. The 15" x 20" deposit bag with pocket will hold 4,000 notes or 4 bundles, and all seams meet Federal Reserve guidelines. This deposit bag is a favorite for high volume cash users.